On the outskirts of Bremen, Germany, the architect Andreas Wenning has created a barrel-shaped building made of zinc, suspended it from a giant oak tree and propped it up with four steel support beams. Two decks step up to the structure, and the interior is as sophisticated as any contemporary building’s. Among other features, there is an oval window seat made of grey felt and white oak where little ones and grown-ups alike sit to stare out at the forest and dream their respective dreams. Tree houses are Wenning’s specialty. His work for his company Baumraum runs from small kids’ cabins such as the ones you might have played in as a child – though his versions are cubic and modernist, wrapped in white, green or pink cement board – to adult retreats for hotels and private clients. And he’s not the only designer creating elevated getaways that both capture a childlike wonder and address the growing call to build vacation spaces able to withstand rising water levels. Kicking back among the branches has never seemed more appealing. 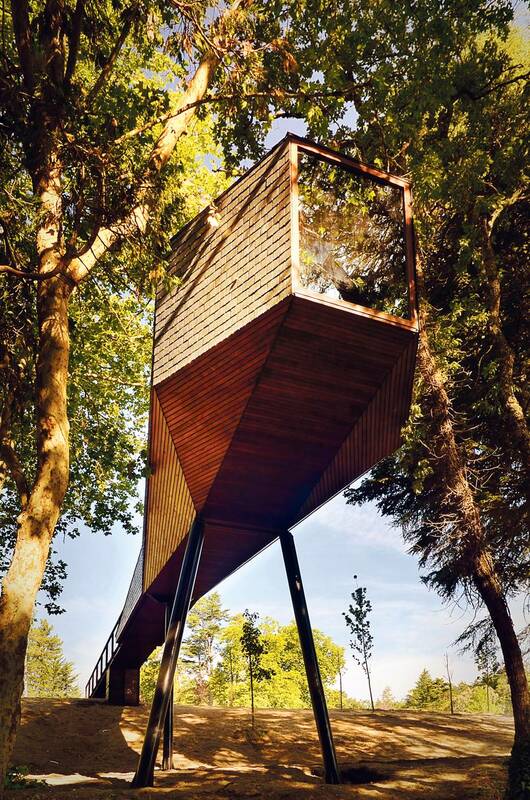 “Who wouldn’t want to live in a tree house,” says Portuguese architect Luis Rebelo de Andrade. “The very idea is magical.” That impulse to create something fantastic was why he built two of them within a century-old private resort in northern Portugal. 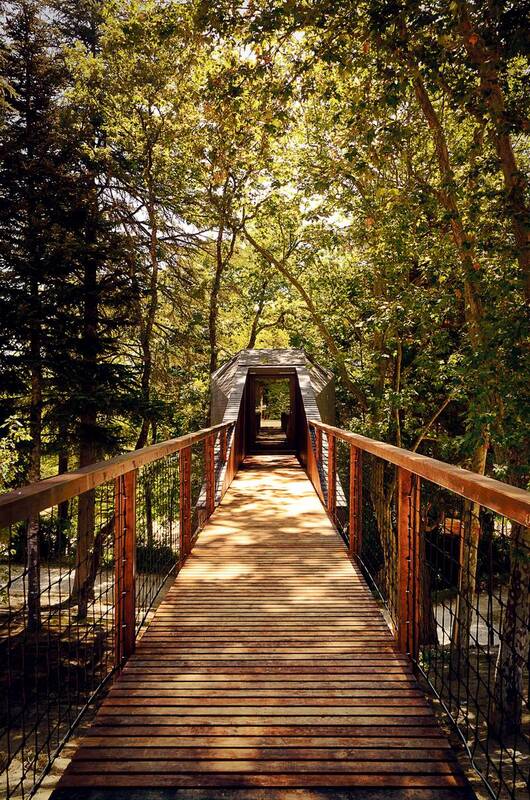 When visitors arrive after an hour-long drive from Lisbon, the Tree Snake Houses, as they’re called, welcome them with an elevated walkway. The ramp leads up into a deciduous forest, the ground dropping further and further away as you approach the main, faceted structure. Each nest-like room is 300 square feet, their angular walls surrounding you in whitewashed wood; glass frames the foliage beyond. Each of the two “ snakes” is a contemporary architectural statement, a long and skinny volume wrapped in panels of slate, with a bulky head that holds the living space. Up close, they provide a tactile experience of the forest, with furnishings handcrafted from locally sourced wood. From a distance – or from the 19th-century tile-roofed buildings at the centre of the resort – the Snakes are entirely hidden. The juxtaposition of art and nature is the chief appeal of projects such as this one, which are especially popular in Europe. The Treehotel, which kicked off the trend when it opened in northern Sweden in 2010, offers five very distinct tree houses, with adventurous designs from different architects, deep in the woods. In the French region of Lorraine, a group of villages has helped draw people to their 5,000-hectare forest with a set of high-design projects along the Sentier du Vent walking trail. 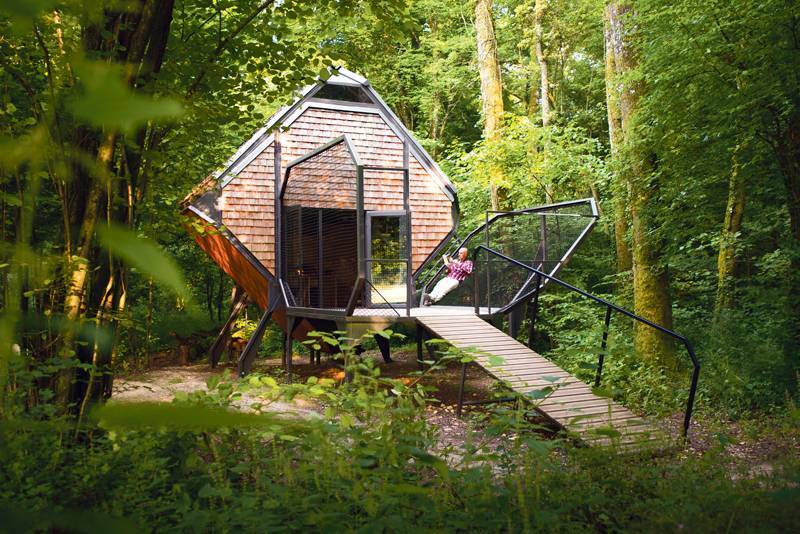 Matali Crasset, the multidisciplinary French designer, created four idiosyncratic cabins out of Douglas fir, acacia and steel. They sit like flying saucers about to land, raised up on steel stilts that protect the trees and their root systems from any damage or pressure. 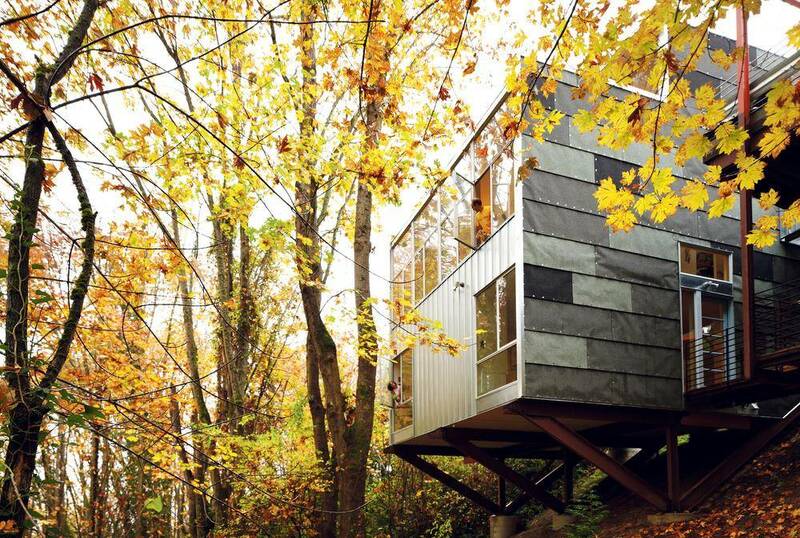 Preserving the natural environment when building these types of structures is a key concern for architects, whether a tree house site is a clearing in cottage country or a dense ravine in the city. 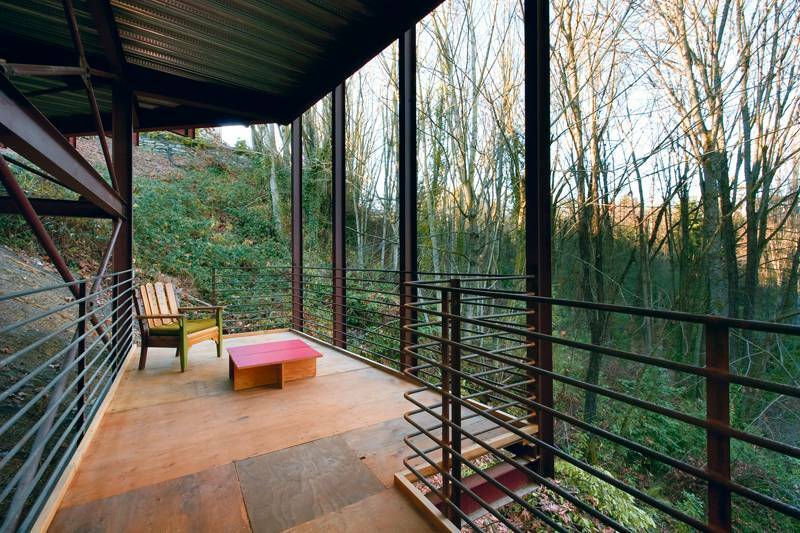 The latter is where Seattle architect Prentis Hale built an urban take on a forest dwelling for his family. Simply called Treehouse, it’s located at the end of a cul-de-sac lined with gracious detached houses. His property is a steep, treed slope that leads down to Colman Park, a large local green space. After visiting the park many times, Hale and his wife, Tracy Edmonds, took on the challenge of building there. Their house is raised up on 11 piers, so that the top of its three floors reaches street level on one side, connecting to the road via a steel bridge. Inside, though, it’s easy to forget that you’re even in the city. Their position, immersed in a grove of maples and removed from the street, gives the family a unique connection to nature, he says. The couple and their two daughters, Pippa and Maisie, keep bees on their roof deck. From the living room, where cork floors and Douglas fir plywood cabinets add to the warm, woodsy feeling, the mood of the forest infiltrates the living space every day. In summer, the light is tinted green by all the leaves and in the fall it is tinted yellow. 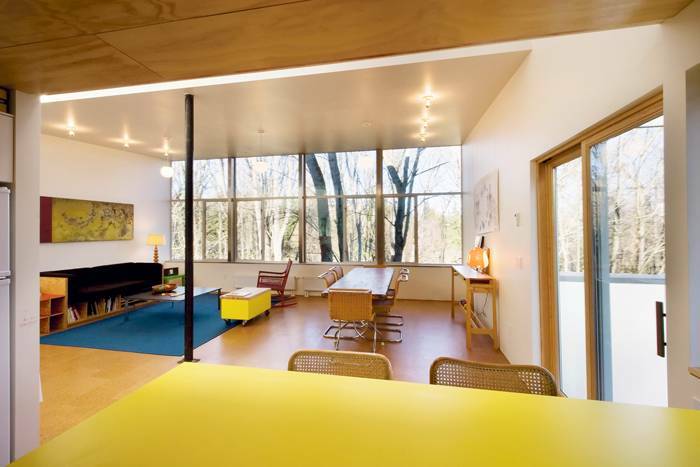 “You can see the seasons change within the house,” he says. And for the two girls, home is quite literally a playground. “ They definitely have fun climbing around – the trees, the columns in the house, anything that needs climbing.” This is the freedom of living in a tree house, perched above the ground and happily out of reach of the world below.